The Capstone Project Internship (CPI) is an innovative project-based program that provides students with an opportunity to engage in rigorous scholarly practice of the core academic skills necessary for the successful completion of a real world internship. Built on the foundation of two principles — project-based learning and internship — it is designed to complement and enhance the in-depth, interdisciplinary study provided through research, trial-and-error and reflective post-project analysis. It cultivates curious, independent, and collaborative scholars and prepares them to make logical, evidence-based decisions, and real-time adaptions: project management. Begun in March 2016, the program has been an integral part of the Stanstead College mission statement, “to prepare students for lifelong learning and success in the global community”. Participant schools have been located in Canada, USA, Vietnam, and Cambodia. Students begin by analyzing the current needs of our target group. This summer, it will be primary school children in the local Danang area as well as children from the orphanage. Working remotely at their home school locations on a shared Google classroom, CIP students propose schedules, programs, data-collecting processes and quality metrics as they put together a summer camp educational experience for these children. Upon approval, these programs will go into place upon arrival in Vietnam, where all constituents will meet in person and make final preparations. Plans will be executed on site, and upon completion of tasks, post-project analysis will occur with publication and strategies for modifications presented. Students will return to their respective homes and work remotely, and final products will be shared on common platforms and social media sites. Students who successfully complete this program receive credit/hours from Stanstead College and/or the Quebec Ministry of Education. The program runs Monday to Friday. On the Saturday following each 2-week session, parents will attend a closing ceremony involving student performances and presentations. Sundays are left unstructured with occasional cultural activity in the area and free time. Students are housed with teachers and chaperones near the Sakura-Olympia campus at the Magnolia Hotel. The costs are reasonable and within distance of restaurants and cafes. All students will be matched with two or three roommates. The hotel rates will be split between roommates. Students are a short walk to the Sakura-Olympia campus. On weekends, they may travel in groups to the beach using cabs or Grab rides. The hotel will provide breakfast, and students will eat with the campers on campus for lunch at no cost. Inexpensive and healthy restaurants are plentiful as are grocery stores for dinner and weekends. Students are responsible for these expenses. "I had wonderful journey this summer. 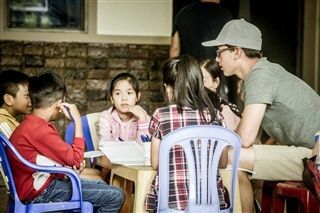 I had the opportunity to go to Vietnam for two weeks and have fun helping kids. It was a life-changing experiment for my first time in Asia. Seeing a smile on every kids' face will be something I won’t forget!" Take a look at our past projects!